Photo above: Larry Hogan Jr. and Anthony Brown greet each other at B'Nai Israel congregation in Rockville on Sunday morning. 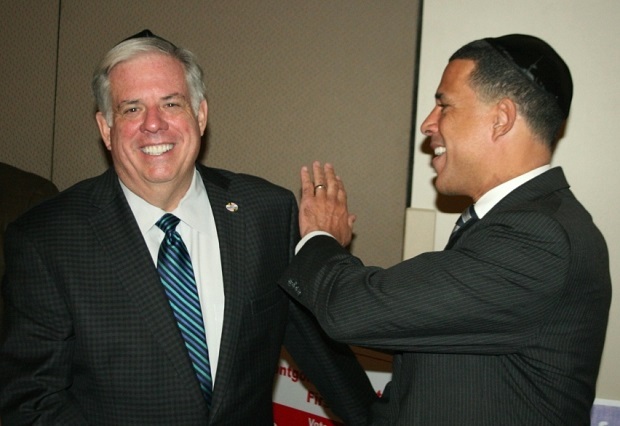 Larry Hogan Jr., the Republican nominee for governor, said his Democratic opponent, Anthony Brown, is suddenly changing his campaign message to match Hogan’s, because polls are showing a message of tax relief is resonating with Maryland voters. Taxes have been a leading issue for Hogan in the governor’s race. Hogan believes it is because of his message to roll back some of the 40 new taxes and fees incurred during the O’Malley-Brown administration that voters in heavily Democratic Maryland have begun paying attention to him. A Baltimore Sun poll now shows a 7 point race, with Brown leading Hogan 49% to 42%. The poll also found that Hogan supporters are more likely to come out to vote and other voters remain undecided. During the forum Hogan said if he wins, he will have the cooperation of Senate President Mike Miller. Hogan, a former Ehrlich administration appointments secretary, said he has experience working across party lines. During his tenure as appointments secretary Hogan said he was able to get 1,839 out of 1,870 people unanimously appointed that required Senate confirmation. The two gubernatorial candidates will face off Monday at 10 a.m. on News Channel 8 with anchor Bruce DePuyt. Two undecided voters, however, have already made their minds up.